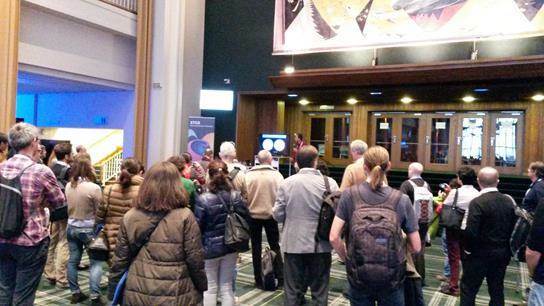 The 13th European Space Weather Week (ESWW13) took place in the Casino Kursaal of Oostende from 14 till 18 November. This international space weather conference was organized already for the 11th time by the Solar-Terrestrial Centre of Excellence (STCE). Participants were not confined to Europe, but really came from all sides of the world, representing countries such as Australia, New Zealand, South-Africa, Brazil, Japan, China and South-Korea. 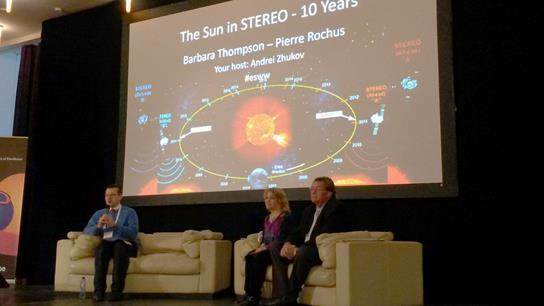 The nearly 400 scientists, engineers, satellite operators, power grid technicians, communication specialists,... gathered to discuss the latest on solar activity and how it influences the earth environment and our technologies. No less than 15 topics were programmed in daily series of 3 parallel sessions. They covered a wide variety of space weather aspects, such as solar energetic particle events, space climate, space weather tools and modelling. Daily keynote lectures introduced the attendees to each series of sessions. 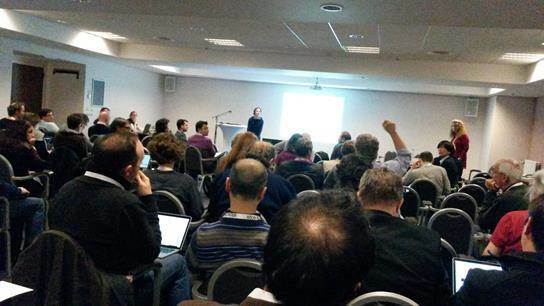 Quite some participants had to make tough choices which sessions and presentations they wanted to attend! 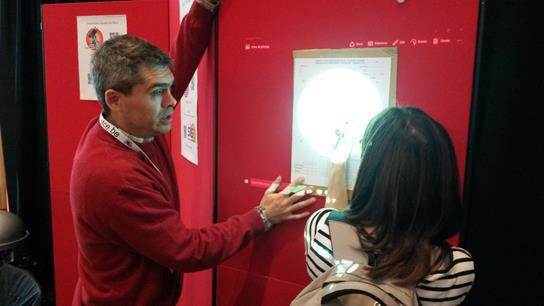 The related poster sessions included also electronic posters ("e-posters"). The afternoon was reserved for the working meetings (20! ), providing the participants the opportunity to discuss in-depth key issues in an interactive style, thus complementing the sessions. There were also more relaxing activities such as the Tutorial on Monday, which focused, not surprisingly, on space weather forecasting. It started with a sofa session on 10 years STEREO. It was followed by 4 hands-on activities, where you could draw sunspots, build/recognize spacecraft, make your own space weather predictions, or visit the B.USOC. A panel discussion on the socio-economic impacts of space weather concluded this fun activity. 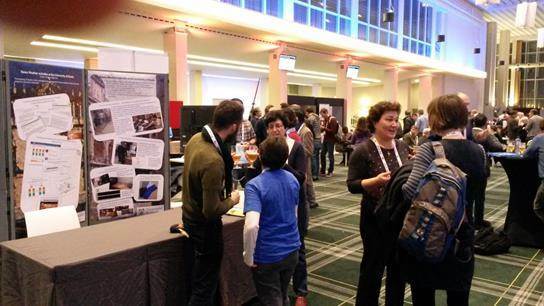 The dedicated space weather Fair on Wednesday afternoon had 21 stand holders! In the spacious "Hall of Honour", visitors could walk from stands on ESA Expert Service Centers, flare forecasting, or radiation doses, to more interactive stands where you could ring the sunspots, make your own CME, or create a solar movie with JHelioviewer. Throughout the week, ESWW participants could also play the online space weather quiz (with certificates for outstanding performances! ), and daily space weather forecasts were presented by 5 forecast centres (Spain, USA, UK (2) and Belgium). Finally, the attendees could really socialize during the after-hours activities. On Monday, the welcome reception was preceded by an impressive medal award ceremony. 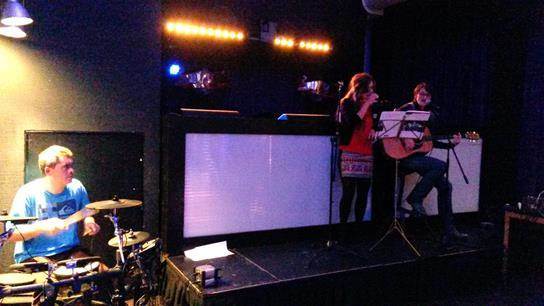 On Tuesday, there was a wonderful music evening in the Casino Lounge, where some participants surprised the audience with their remarkable musical and vocal skills. 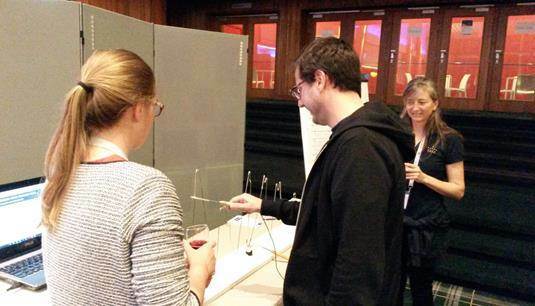 On Wednesday, the Fair was followed by the traditional beer-tasting, where most participants tasted more beers than there were sunspot groups present on the solar disk. That was not so difficult, with a nearly spotless Sun! On Thursday, the conference dinner took place in the Hippodrome (buildings of the Wellington Racetrack). Most guests arrived with soaking wet clothes (courtesy of a good Belgian shower), but were able to warm themselves with good food and drawing some nice cartoons. Also, the 6 winners of last year's bet on the number of X-class flares got a sweet award. Once again, the enthusiasm and drive of the participants and organizers assured another successful edition of the ESWW. Thank you all, and see you next year!